The former chef of Queen Elizabeth, Princess Diana, and Princes William and Harry shares his surprisingly easy recipes for a royal Christmas dinner. Chef, culinary instructor and caterer Darren McGrady knows a thing or two about hosting epic dinner parties: As the former chef to England's royal family — first for Queen Elizabeth II in the royal kitchen at Buckingham Palace and then as the personal chef for Princess Diana at Kensington Palace — he cooked not just for the royals, but for celebrities and dignitaries from all over the world. After 15 years with the royal family, McGrady moved to the U.S. and became a personal chef to a family in Texas. He now runs a catering company in the Dallas area, where he helps his clients with high-end events, teaches cooking classes and leads culinary tours. With those upper-crust credentials, you might assume that any recipes McGrady shares would be way too fussy for a home cook. But the recipes in his book, "The Royal Chef at Home: Easy Seasonal Entertaining," are approachable for cooks of all skill levels and he includes plenty of time-saving tips and make-ahead options. McGrady told TODAY Food that he wanted to showcase "recipes that were foolproof — to the standard of what I did at Buckingham Palace but doable as a home chef." Prince William, Kate, Duchess of Cambridge, Prince Harry and Meghan, Duchess of Sussex — aka the royal "fab four" — will spend Christmas Day together at Sandringham, Queen Elizabeth’s estate in Norfolk. And while McGrady never worked directly for the two couples, he is sharing five recipes that were served for many years to all the royals for Christmas dinner. (We do know, however, they will be served these gingerbread cookies.) Each dish has a connection to the royal family, but you don't need the skills of a royal chef to make them. With a little planning, you'll be able to relax and enjoy the meal with your friends and family, instead of running back and forth between the kitchen and dining room. After all, says McGrady, your guests aren't coming over for a restaurant-style experience, but "they are coming over for your company." Potted shrimp — a buttery spread made with chopped, seasoned and cooked shrimp served on toast points — makes an elegant appetizer for your guests to nibble on before dinner. 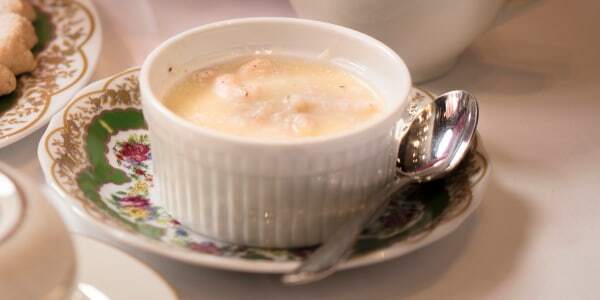 "At Balmoral Castle, the Queen would receive a delivery of Morecambe Bay shrimp each week to be served at afternoon tea with hot crusty Melba toast, so the spicy shrimp butter would melt into the toast," says McGrady. He calls it the "ultimate comfort food after a chilly day in the hills." 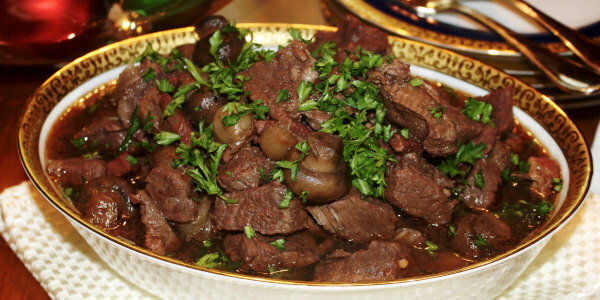 Beef Bourguignon may be French in origin but it's an English royal family favorite. McGrady would make it with a special twist by using venison from royal shooting parties around Christmas and the New Year. "Shooting lunches at Sandringham and Balmoral Castle always had to be hearty meals — lots of stews with mashed potatoes," said McGrady. "Beef bourguignon could be made with beef or with venison off the estate." He added that the Queen preferred the latter. McGrady and his team would make a batch and send it out with the shooting party in special hunting boxes designed to keep the food warm. "The Balmoral Castle gardens were amazing and provided fresh incredible produce to the kitchens daily," said McGrady. 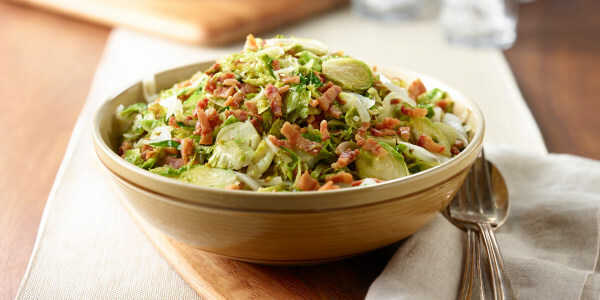 This simple dish of Brussels sprouts cooked with onion and bacon is the perfect example of the type of dish he'd make with the bounty from the local produce. And "anything tastes good with onions and bacon," added the chef. 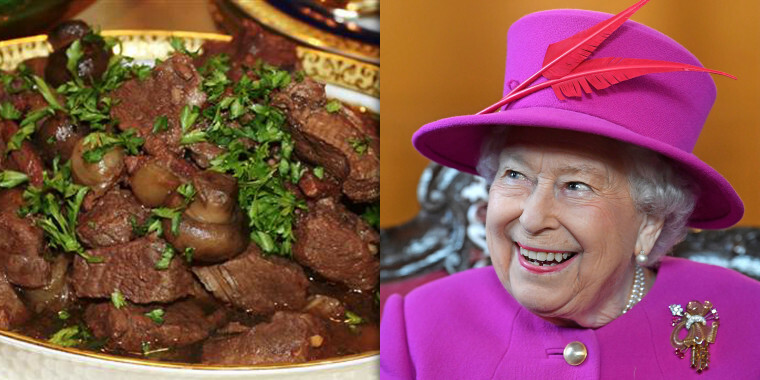 But if you want to be really true to a royal feast, you'll have to omit one ingredient from this recipe: "Of course, we couldn't use garlic in the recipe when the Queen was at the table because she did it like it," said McGrady. "We served bubble and squeak — a traditional British dish of mashed potatoes mixed with chopped cabbage — a lot at Buckingham Palace," said McGrady. 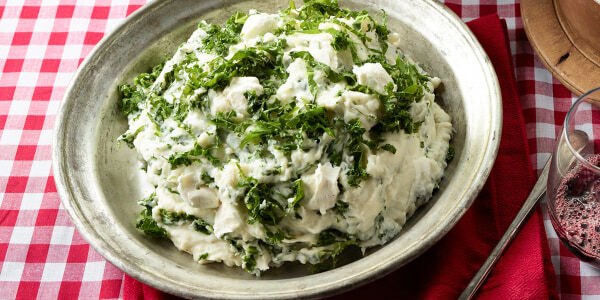 "That inspired me to create this dish using healthy and trendy kale." The mashed potatoes can be made ahead: Simply rewarm before serving (you can heat them in a casserole in the oven or in bowl set over simmering water). This easy date and apple dessert is another dish inspired by a royal retreat. "Sandringham House had its own apple orchard and would supply the royal kitchens," said McGrady. 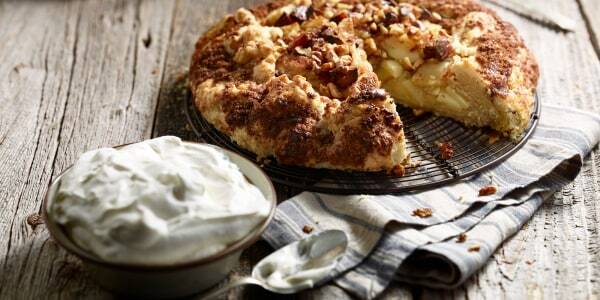 "This rustic twist on apple pie would be perfect for Sandringham royal picnics." And don't be afraid of the word "pastry" (which can be notoriously difficult to navigate) — the dough for this one is simply mixed by hand, rolled out and then shaped with your fingers — it's OK if it doesn't turn out perfect, remember it's supposed to look rustic!